This split-second story captures the end of an era for music stores. 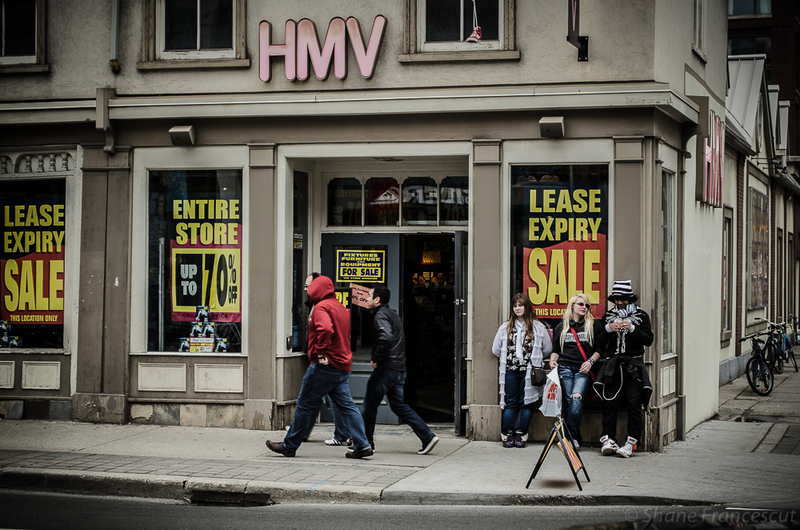 HMV is the last surviving music store chain in Canada, and it’s finally closing its doors. This store has been a staple on Toronto’s Queen Street for many years, and the three teens loitering outside represent the last of a dying breed of young adults who have spent many lazy afternoons and summer wages on the latest hit records. Nice — I’ll have to come up with an image for this one! For some reason the link doesn’t lead to a post on your blog 😦 I’d really like to see the post if possible… I always love your stuff. Why the last one? I’ve always enjoyed your photos. What’s the story? Great . .. I will join the challenge soon . . .
Looks like a great challenge! Can’t wait to scour my photos. Photos are from one of my husband’s deployments to Afghanistan. Wonderful that will be great! Here is my Story in a Frame. Thank you Shane for that great idea! Wow! That’s a wonderful photography prompt for all moment-catchers! There are so many stories! Choosing the photo will be difficult. So glad you enjoyed the topic this week. Here’s some of my contribution this week! Seems like a tough one……but fun! What a great idea for a challenge! Gonna be a tough one. tough challenge. but fun. 🙂 my entry for this week. I wonder if you think my story will have a happy ending or not? I love this shop where you can buy old records. Hope you like it. Thank you! Dont know what went wrong with that! Here is my a fun entry. The Look on her face says it all. Great choice. Last weekend gave some great frames to choose from. Happy wkend all. Anyone know why my pingback never shows? I cant see on your post where there’s a link to this page. Maybe add one, then republish. Your https theory sounds plausible. I used to have https when attempting to do pingbacks, and they never registered. Once I just used http it worked fine. So sad to see a relic end its reign. Great shot here. I will put some thought on this one. 🙂 Thanks for the inspiration. A little bit of love and romance in a spilt-second…. Excellent shot, and so glad you enjoyed the challenge. Interesting topic, have to get my thinking cap on! HMV is still (just) hanging on over here! I follow Shane and his wonderful photography. This is a wonderful example! 480 Responses While this challenge is closed to new entries, we encourage you to visit the Reader to find other avid bloggers. 123 DP Photo Challenge – Split Second Story. I see beauty all around by rob paine The Stone House in Manassas, Va.
anotherdayinparadise WPC Split-Second Story: Been Fishing. Mabel Kwong What Is Happiness? Babsje Heron Who Needs a Time Machine? Tish Farrell Lust to rust: is it a sign? Delightfully Italy Italian images: full stories in a single frame. Books, Music, Photography, & Movies Camera shy ? Not just me. Master of Something I'm Yet To Discover We Forgot The Children! B's Words I don’t like her. Light Words Weekly Photo Challenge: Split Second Party in My Kitchen! blueribbonfair My daughter and the one that Didn’t Get Away: A “Fishy” Story. artishorseshit Did we pack the toothbrush? Sitting on the Porch DP Photo Challenge – Split Second Story. Restawyle DP Photo Challenge-Split Second Story. aNadventures Split-second story: Staying or going? The Urge To Wander A Moment In Time…….